When setting up a workshop, a planer thicknesser is one of the standard bits of equipment but space will not always allow this luxury so, have you ever considered using just a thicknesser? Metabo have sent us their DH 330, so here are my findings so far: The basic configuration for most of these types of machine is broadly similar. The cutter block and motor are all housed in a moveable section, which rises and falls inside the machine's outer casing, through a winding mechanism. Simple and effective. In addition the Metabo has some interesting refinements, as well. 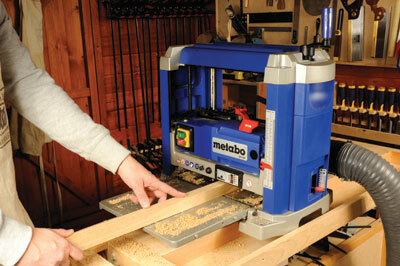 The cutter block and motor can be locked in position with a large red lever, to ensure no movement during planing. Also, you can preset the thickness you want to cut to with a selection lever on the side. There's also a very handy indicator which tells you the thickness of cut you are making. The machine has other nice touches as well. 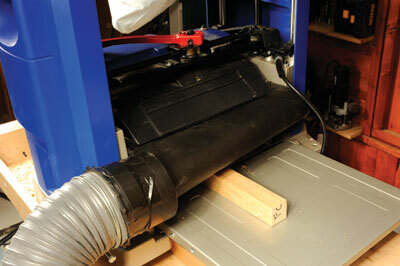 Under the outfeed table is a storage bag for all the bits associated with the machine. In short, a very nice machine, with lots of great touches. My first few days working with this have been a joy. The finish is very good off the blades, with very few undulations in the timber caused by the cutters and in-feed speed. The little touches like depth of cut indicator, and settings for pre-selected depth, are really handy.